Depending on who you talk to, you may find yourself in a conversation with someone who thinks there is a fundamental conflict between science and Christianity. This typically happens on the fringes of both Christianity and the so-called scientific community. If there is a group of Christians who find science antagonistic toward their religion, it is often (but not exclusively) fundamentalists. And, beyond the realm of actual science, there are secularists the suppose that the information of science fundamentally undermines the tenets of religion. 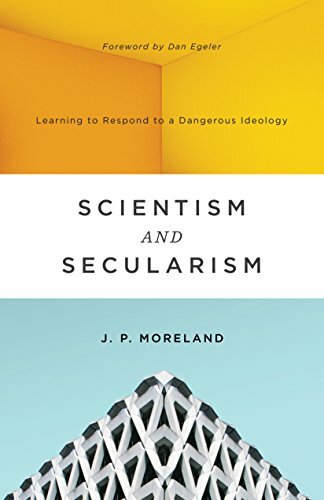 In his recent book, Scientism and Secularism: Learning to Respond to a Dangerous Ideology, Moreland argues for a distinction between science and scientism. He also argues that scientism is fundamentally corrosive to society and leads people away from truth. In popular culture, scientism has overtaken other religious systems as a dominant plausibility structure. In other words, it is how many people make sense of the world around them. Not only does this often displace belief in God, but it undermines the ability of those who hold to scientism to accurately evaluate competing, non-scientistic perspectives that might provide better access to truth. Scientism has influenced several of the shifts our culture has witnessed in recent decades. The first is that it has taught people that science sums up the totality of accessible knowledge, while religion is blind faith divorced from reality. This myth may help people coexist, but it does much less to encourage the pursuit of truths that cannot be known empirically, much less fairly evaluate those that haven’t adopted the current orthodoxy of scientism. A second shift caused by scientism is the pursuit of immediate gratification instead of honest pursuit of truth. All the truth that can be known is knowable by science. Scientism claims that all there is in this world is material. Therefore, there are no consequences to pursuing whatever comes easiest to hand. That leads to the third major shift caused by scientism, which is the adoption of a minimalist ethics. This rejects the idea that there is a good or bad, apart from the apparent benefit or harm measured by surveys, metrics, and calculations. This, of course, leads to bad science, where those who expound the conclusions that naturally and obviously arise from their data can be ridiculed, ousted from tenured posts, and assaulted if their conclusions go against the presuppositions of the mob. If scientism is true, and measured harms provide the evidence of actions to avoid, then what is not measured cannot be wrong. Moreland is right to note that scientism is a significant problem, and that it is pervasive in our culture. His book rightly shows how fake-science, which is what scientism is, leads to militant secularism. Therefor his book serves as a warning for Christians to identify the influences of scientism, particularly in their own homes, and root them out. Scientism and Secularism is a book for Christians trying to figure out what is wrong with the world. How have we gotten to the place where there are intelligent people who will argue in public that all decisions must be made based on empirical evidence? Moreland traces some of the influences that led to the current situation, but, more significantly, he explains why scientism is wrong and even self-refuting. At points this book is a little dense for the average reader. Moreland is communicating some complex philosophical ideas as clearly as can be, but there is a level of complexity in his arguments that cannot be reduced without detriment. This book will most benefit those who have some background and interest in philosophy. At the same time, if a reader is willing to plow through the sections where Moreland is a bit more technical, then there is much to be gained for the educated laity. It offers both warning and antidote to a philosophical movement that is growing in strength and is threatening to displace both sound science and well-formed orthodox Christianity in the minds of many both inside and outside the church.